WAGAH (92 News) – Pakistan and India resolved technical matters, including the height of the road, regarding the Kartarpur corridor during the delegation level talks at Wagah on Tuesday. The meeting lasted for three hours also completed demarcation regarding the corridor. Both sides have installed barbed wires in their territories. The next round of the talks will be held in Wagah on April 2. 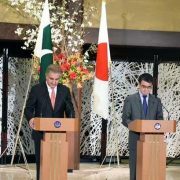 Both delegations will submit the reports on the dialogues to their governments today. After the survey report, consensus will be developed over the crossing points. A 10-member delegation of Pakistani experts participated in the talks. It is hoped that the first phase of the corridor will be completed before the 550th birth anniversary of Guru Nanak, the founder of Sikhism.